MEMPHIS, Tenn. -- Half a century ago, the enthusiastic crowd eager to hear from the Rev. Martin Luther King Jr. roused him from his bed at the Lorraine Motel across town in a thunderstorm to Memphis' Mason Temple Church of God in Christ. King's words rang anew during the program before his youngest child, Bernice King, addressed the audience. Calling her older brother, Martin Lither King III, to join her in the pulpit, she discussed the difficulty of publicly mourning their father - a man hated during his lifetime, now beloved around the world. "It's important to see two of the children who lost their daddy 50 years ago to an assassin's bullet," said Bernice King, now 55. "But we kept going. Keep all of us in prayer as we continue the grieving process for a parent that we've had yet to bury." As the world prepares to mark the 50th anniversary of King's murder, the milestone coincides with a resurgence of white supremacy, the continued shootings of unarmed black men and a parade of discouraging statistics on the lack of progress among black Americans on issues from housing to education to wealth. But rather than despair, the resounding message repeated in the building was one of resilience, resolve, and a renewed commitment to King's legacy and unfinished work. The 11th Annual Bridge Walk for Peace on the Ben Franklin Bridge on April 4, 2018. Just as it was on King's last night in Memphis, the forecast Tuesday called for a storm to again rattle the church walls, evoking the memory of King's pronouncement that he had "been to the mountaintop," his thunderous remarks were outdone only by the evening's weather. With an enthusiastic crowd filling Memphis' Mason Temple Church of God in Christ, the atmosphere was heavy with nostalgia Tuesday for the evening 50 years ago that the Rev. Martin Luther King Jr. gave his final speech. A gospel singer led a rousing rendition of "Lift Every Voice and Sing," and the gathering took on the air of a mass meeting, as if the crowd could again will King from his hotel bed across town. It was in this sanctuary that he delivered his famous "Mountaintop" speech the night before he was assassinated. The commemoration was part of a week of events celebrating King's legacy. Lee Saunders, a national labor leader, recounted how that night in 1968, King made an unplanned appearance to deliver the famous speech without notes after his aides saw how passionate the crowd was: "There was one man they wanted to hear from." But Saunders stressed that the purpose of the week's commemorations was not just to look to the past. "Dr. King's work - our work - isn't done. We must still struggle; we must still sacrifice. We must still educate and organize and mobilize. That's why we're here in Memphis. Not just to honor our history, but to seize our future," he said. Saunders was among the first speakers, taking the pulpit just after a video message from former President Barack Obama. 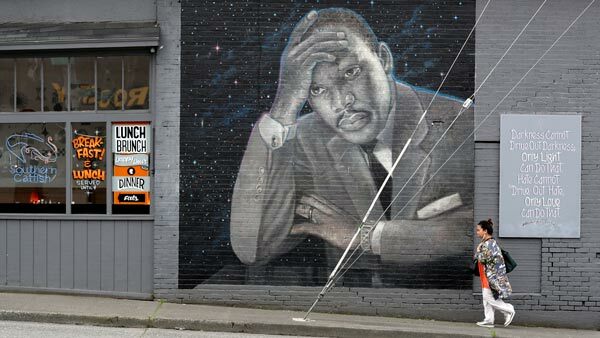 "As long as we're still trying, Dr. King's soul is still rejoicing," Obama said on the video. Some of the sanitation workers who participated with King in a 1968 strike sat in the front row and were treated like celebrities, with audience members stopping to take photos with them before the event started. Contemporaries of King's including the Rev. Jesse Jackson were also in attendance. The commemoration of the "Mountaintop" speech followed an announcement earlier in the day by civil rights leaders who are reviving an economic justice campaign first planned by King. The organizers of a new Poor People's Campaign are planning 40 days of marches, sit-ins and other peaceful protests. "This first 40 days is not the end; it's the launch," said the Rev. William Barber of North Carolina, one of the co-chairs of the revived campaign. "You will see simultaneous moral direct action. You will see simultaneous training of people to prepare for a season of massive voter mobilization." Starting May 14, clergy, union members and other activists will take part in the events in about 30 states, targeting Congress and state legislatures. Then, on June 23, organizers plan a large rally in Washington - similar to what King had envisioned. The original Poor People's Campaign was carried out in 1968 after King's death by other civil rights leaders. King had envisioned the Poor People's Campaign in Washington as a way to speak out against economic injustice, as he shifted his focus from civil rights to human rights. But before he could finish those plans, he came to Memphis in 1968 to support a strike by black sanitation workers who were tired of dealing with low pay and dangerous working conditions. King led a march in Memphis that turned violent on March 28, and he went back home to Atlanta. Seeking to prove that non-violent protests still worked, King vowed to lead a peaceful march and returned to Memphis days later. The civil rights leader was standing on the balcony of the old Lorraine Motel when he was shot on April 4, 1968. He died at a hospital at age 39.